Whether you're playing games on PC or console (or both), a wireless headset can be a real luxury. You avoid the inconvenience of wires going between you and your games machine, and you can also enjoy the convenience of being able to get up and grab a snack while still being able to listen to the action. 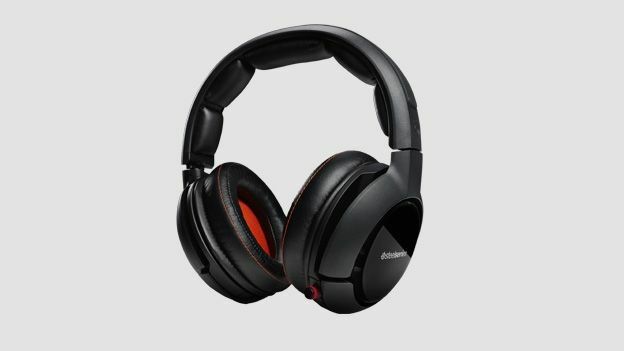 If that sounds attractive to you, then the SteelSeries H Wireless headset is one of the more expensive offerings on the market, justifying its high price tag with features such as Dolby 7.1 surround sound, 20-hour battery life, and compatibility with PCs, Macs, consoles and mobile devices. Is this the gaming headset to end all others? The moment you open the H Wireless headset, it's easy to tell it's a stylish, premium package. The headset and wireless transmitter are elegantly presented first, while the manual, spare battery and multitude of cables are all tucked away neatly underneath. The headset itself is particularly elegant, with soft leather-like material on the ear cups and headband, a neat retractable microphone and very few buttons and ports to complicate matters. The headset also takes a small rechargable battery, which you slot into the left earcup by twisting the external panel. SteelSeries' H Wireless are not quite as fashionable as lifestyle-focused headsets from Bose and Parrot, but they're a heck of a lot more stylish than those from gaming-focused companies like Turtle Beach and Tritton. The wireless transmitter is similarly graceful. It's slightly bigger than an Apple TV, which is perhaps a bit too big, but it houses plenty of connections, an OLED display and a couple of control wheels and buttons. There's also a hole in the side to charge one of the two included rechargeable batteries, meaning you can keep one charging while using the other. Setup of the SteelSeries H Wireless receiver varies depending on what source you're using, but the manual explains the process for each major gaming platform, and includes most of the cables you need. If you're using a PC or Mac, all you need to do is connect the transmitter to your computer using the mini-USB cable provided. Your computer will install the necessary drivers, so all you need to do is add your PC as a source on the wireless transmitter, and choose the SteelSeries headset as a playback and recording source from within Windows' sound settings. If your computer has an optical audio output, you can use that instead of USB, which is the method we preferred, as it allowed us to output true Dolby 7.1 surround sound as opposed to stereo over USB. If you switch between a headset and speakers, it can be annoying to go into your system settings each time to change the audio source, but this is true of most headset setups in Windows. Console setup is a little bit more complicated because it involves more wires. On PS3 and PS4, you hook the transmitter up to the console via optical audio, then connect the USB cable for chat, and make the relevant changes in the console's audio settings screen. On Xbox 360, you just need the optical cable, but you use a separate cable to hook up the headset directly to the controller for chat. Right now, the H Wireless will not work with Xbox One, but neither do headsets from other manufacturers until Microsoft hopefully addresses the compatibility issue with a future update. The wireless transmitter also includes an optical audio out port so you can continue to send the audio to other speakers - our only grumble with this is that the box doesn't include a second optical audio cable. Thankfully they're cheap to buy, if you don't have one already. The back of the transmitter also includes a power supply input, even though it wasn't needed when connecting over USB, plus analogue audio in so you can still listen to devices that don't have an optical connection. The SteelSeries H headset is extremely comfortable thanks to its lightweight construction, soft leather-like finish and comfortable memory foam padding around the ears and head. The headset is great for long gaming sessions, which is a feature also supported by the battery packs, which last for a longer-than-average 20 hours. It's a luxurious, high-quality headset with a sleek all-black finish except for some tasteful orange stitching and orange speaker covers. The overall understated design is complemented by the fact that there are only two buttons on the headset - one to turn it on/off and mute the microphone, and a wheel to adjust the volume and change audio presets. Compared to many gaming headsets that are covered in buttons, we much prefer this simple design. Finally, there's a flap on that right ear that covers two ports - one for the wired chat cable needed for Xbox 360, and another 3.5mm headphone port. You can use this port to hook up any normal wired audio source such as a mobile or tablet, or if you're using the SteelSeries' transmitter, you can plug in another pair of headphones and share your audio with a friend. It's a rare demand from console gamers and perhaps more suited to friends who are travelling together, but we applaud SteelSeries' attention to detail. Just bear in mind that the headphones don't fold up or come with a case, so they're not that suited to portable use otherwise. The SteelSeries H Wireless headphones sit at the premium end of the market, and this is reflected in the sound quality they produce. Whether you're listening to music, movies or games, the high notes are crisp and detailed, while the bass is deep and rich. The low notes aren't quite as strong as we've heard from other headphones at this price point, but these headphones still create an impressive soundscape overall. The headphones support Dolby Digital 5.1 on consoles and up to 7.1 from other platforms such as PC, and convert that surround signal into a headphone-friendly mix. The results are immersive, allowing you to hear sounds from the background from compatible movies and games. The H Wireless features a microphone that pulls out of the headset itself - it neatly retracts back when not in use - and glows an attractive red colour when muted. The standard chat settings worked fine for us during testing, but ChatMix and LiveMix are features that allow you to customise the balance between game volume and communication. ChatMix is a manual setting based on your own preference, while LiveMix dynamically reduces the game audio whenever you're chatting. There are also six different audio presets, which include options such as 'balanced', 'voice' and 'music', and once you've tailored all these options, you can save five different profiles such as 'Movies' or 'Call of Duty', for example. The customisation available through the transmitter is fantastic - you can select which options you want to be able to change remotely through the control wheel on the headset itself, and hide away the options you never use. Perhaps more importantly, the wireless range is excellent - it's quoted as 12m in a straight line, but we found we could go three floors away from the transmitter before the signal began to break up, which is great. Perhaps the only things missing are game-specific audio presets like Turtle Beach has for Call of Duty and Astro has for Battlefield, but such features are often more useful to those companies' marketing teams than the end user. The more pressing omission is the lack of Bluetooth support, which would have allowed you to connect a mobile phone to take calls or listen to music. The SteelSeries H Wireless headset is a well-made, feature-packed and high-performing gaming headset. It's not cheap, but you get your money's worth, especially as it's compatible with pretty much every gaming device out there (with Xbox One support down to Microsoft to sort out). The SteelSeries differentiates itself from the competition with excellent wireless range, a fantastic interface, and an intelligent approach to batteries and charging. If you're a PC gamer who's sat next to your machine, you can save some money by choosing a wired headset, but if you're going to go with the luxury of wireless, the H Wireless is one of the best premium options available.